O chato desta missão é em Falanar obter os 5 estilhaços para formar uma pedra. Feito isso o resto é matar os 5 magos elites que ficam ao redor do portal onde sai o boss, feito isso, ative o portal com a pedra e bata o quanto quiser no boss, ele vai te matar, a intenção é esta mesma... Assim que lhe matar recupere seu corpo e bata a vontade no Boss... Ele estará travado no portal e nem vai se mexer... mate ele e entregue a quest! Kill mobs around the area for Legion Portal Fragment , in order to create Greater Legion Portal. The portal spawned Vizuul the Twisted, though he had 31 mil hp for me. This quest is in Faronaar in Azsuna, for anyone as confused as I was. Not soloable** thanks to an imprison mechanic like that of the robotaur boss in Arcway. Doesn't do much damage otherwise, so a couple of reasonably geared DPS plus a tank should be plenty. 2. You can reset him and wait until he stand inside his portal. After the reset he dont attacks you back but despawns after ~3 min. I kited the mob that is summoned up to the flight master at the Illidari perch and the guards killed it for me. The Legion Portal Fragment can be looted from any demon on the Broken Isles it seems. I got mine in The Arcway. EDIT: Also looted these in Moonclaw Vale in Val'sharah (http://imgur.com/a/VwpeB). The next quest in the chain is called "A True Test", which doesn't appear to be in wowhead's database. "A Feast Fit for Odyn" - Acquire 3 items from mob in Stormheim, Highmountain, and Azsuna. Best mobs to farm them are Manastalkers. Instant respawn of 2 of them. Got it done in 10 minutes. Imps around the summoning portal is work fine. Got my parts of the stone within few groups. Did it today in a pug group as a tank with a mage. We didn't have enough dps to kill him in time so he did his prison thing and then just smacked both of us. After that we pugged a full group with 2 more dps and a healer and he was dead in seconds. If you go up the hill to the section with the cages and felhounds, they respawn very quickly (esp if there is a world quest) and you can farm them for the portal pieces. Took me about 10 minutes or so. The big quest mob guy can be cross faction killed and looted. Ok so I accidentally dropped this quest, where do I get it from again! HALP! If you want the fastest way to get the key ever, go to Grizzleweald (roughly 66,77) in Val'sharah and kill the grells. They drop the stone fragments, and re spawn like rabbits. Took less than a minute to get my key. Reset the boss, he won't attack after you do. This works as of 12/11/16. 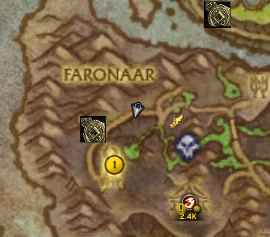 You are here because you took the flight path to Illidari Perch in Azsuna, then went to the Altar of End Times at 27, 50 in Faronaar, and you can't click on anything. So, basically what you need to do, is collect (5) Fragmento de Portal da Legião, with which you can form the complete Pedra do Portal da Legião Maior. As another comment mentioned, I just kept killing the Manastalkers and other NPC's in the area of 38, 45 Pits of Despair. It took me about 20 minutes to get all (5) Fragmento de Portal da Legião. Click on the stack of 5 and create your Pedra do Portal da Legião Maior. Now head back to the 27, 50 to the Altar of End Times again, kill off the 4 NPC's around the center of the altar before you use the Pedra do Portal da Legião Maior. Upon summoning him, if you are in a group he's an easy kill. If not in a group, if you reset him, and then attack him again he won't fight back. So as a hunter I feigned death, then upon attacking him again he did not fight back at all and I was able to down him and get the Twisted Runebindings off his corpse. Hopefully this explanation helps a little bit. Oddly enough, upon reading the quest description after figuring all of this out, the description makes more sense. Anyone know, what is the final rewards from this quest chain? AP, appearance or whatnot? As it turns out, dying is also a great way to reset the boss. :D I tried the kiting method but he killed me on the way. When I rezzed, he was just standing there as others have described. I hit bloodlust and took him down without him moving a muscle. The resetting him method did not work for me. He reset and wouldn't hit me, but he was evading so I couldn't damage him. Easiest way is just to use quest group finder. Took like 2 minutes for 3 people to join me, then less than a minute to kill him. You may, already, have 1-2 fragments in your inventory, due to killing mobs, for World Quests, etc. legion portal fragment.. search your inventory first. If you bring along a tank friend and your dps is 550k+, this is piss easy. Half his health was cut down in about 5 seconds. I did this as BM, and I believe one of my pets could have tanked for me. As always with grouping quests, the suggested players is 1-2, not 5. We had trouble looting the fragments needed while in a raid group. The fastest way after 7.2 is to queue for Satinax farming, they will drop within 5 mins or less. If you have issues mustering up the DPS for him, there's Pedra de Fenda Instável on the floor around the portal which might help. Tried to solo the guy, got rekt. Came back to corps and he would not attack me, so I downed him. If you have the World Quest Group Finder Addon (WQGF), you can also just join a group without doing anything yourself towards quest progress. Once in the group, just hit the boss at least once, and when it dies, your quest will complete. Dying to turn him into potato mode doesn't always work. Tried that, he stood there permanently evade bugging until despawning. Bloody stupid of Blizzard to make mechanically unsoloable quests, once the expansion launch wave of players on the quest dies down, it becomes harder and harder to group up. The bug to turn him into a target dummy still works in 7.2.5 7.3.5. Just mount up after summoning him, agro him then fly away, he resets then you can kill him as a target dummy. Totally idiotic fight. If you solo him he uses an ability Prisão Etérea to imprison you (looks more like a bug than anything as I was half underground) and you die. Then when you rez and come back he just stands there and does nothing as you kill him. Also, I tried both ways of getting the fragments (on 2 different toons). Killed the grells and just killed the imps in the Trickster area (right near where you summon the boss). I didn't see any difference, I'd just kill the imps as it's close. Kill demons around Faronaar for the fragments. You'll probably get one or two of those stones that allow for mind-controlling a demon in the process. Combine 5 fragments into the summoning stone, use it, mount up, wait until boss spawns and you get aggro, fly away, come back, MC one of the nearby elite Infernals, beat the crap out of the target dummy and you're done. Reseting him to make him not fight back still works as of now, 9th of December 2017. If you're dps or a tank and have a 900+ gear score, all you need to defeat Vizuul is one other person in order to avoid his bugged debuff. He has all of 28m health, my frost DK and a feral druid shredded Vizuul in about 10 seconds flat. Solo'd this as a ilvl 955 (2018-01-18) shadow priest. The problem was the imprisonment part, that I couldn't survive through. Once I died, the boss reset - when I came back, I was able to nuke him down. Can confirm as of Jan 25th 2018, Vizuul still does not attack when he is reset. Super simple. Summon with greater portal stone, get on flying mount, let him aggro, fly up, de-aggro, and then kill him. Even if you don't bug it he dies stupid fast if your gear is current. Just for anyone working on this quest after Antorus has been out a while, a decently geared toon can easily do this on their own. No need to gather up the suggested five players. (Seems like common sense, but I was unsure if the quest items would get lost after I attempted it, and didn't want to waste more time gathering more). Pick up an Amulet of Command. One will almost certainly drop while farming the Manastalkers or Imps for Legion Portal Fragments. (Personal preference: The imps around Mother Ozram @ 31.3,50.6 respawn rapidily, giving a Greater Legion Portal Stone in 5-10 minutes). Enslave a Netherflame Infernal that pats around the Portal area. Once he has been engaged, dodge Hammer Strike and interrupt Fel Firestorm. Vizuul will use Nether Imprisonment on the infernal pet, making the fight trivial. Kill mobs all around the are to collect 5x Fragmento de Portal da Legião which creates a Pedra do Portal da Legião Maior to activate the portal and summons Vizuul, o Perverso. He's easily soloable with some decent gear. I was farming for the key parts, when another player randomly walked up and activated the portal. I was able to kill it with him and get the bindings. Meaning, only one person has to farm it! The reset bug didn't work for me on latest patch (BfA pre-patch). I died and came back and he still attacked me. I couldn't kite him all the way to the flightmaster either. But you can outrange the imprison mechanic. I kited him part way up the hill then solo'd him there. 215 prot warrior. this quest is so dumb, drop chance is way too low, had to spend 30 minutes on a lvl 120 to get the stones, then I used the item and it tells me , im mounted, and guess what, there is cooldown if you use it., so I had to wait an other minute for it. Fastest way I've found for farming the fragments is by killing the spider demons on the Isle of the Watchers. Coords 41.5 - 87.0. Getting all five fragments takes maybe 2min? I went to Grizzleweald and killed dozens (at least 15 minutes) without getting a stone. I went to Isle of the Watchers (recommended by GrizzleyGrif below) and got all five within the first minute. Maybe it's a coincidence, probably not. Use uma Pedra do Portal Maior para evocar Vizuul, o Perverso, no Altar do Fim dos Tempos em Faronaar e colete as amarrunas dele. Chegou a hora de testar nosso trabalho infundindo a mais potente fonte de poder de magia vil. Raramente os lacaios da Legião carregarão fragmentos das maiores pedras do portal usadas para abrir as portas para seus mestres eredades. Se você reunir o suficiente para formar um pedra completa, poderá usá-la em Faronaar para chamar o eredar senhor Vizuul, o Perverso, no Altar do Fim dos Tempos. As amarras que Vizuul usa para fortalecer seu poder devem levar o Coração ao seu limite máximo. Você está com as amarras? Agora, vejamos o que acontece se usarmos o Coração para drenar o poder deles.